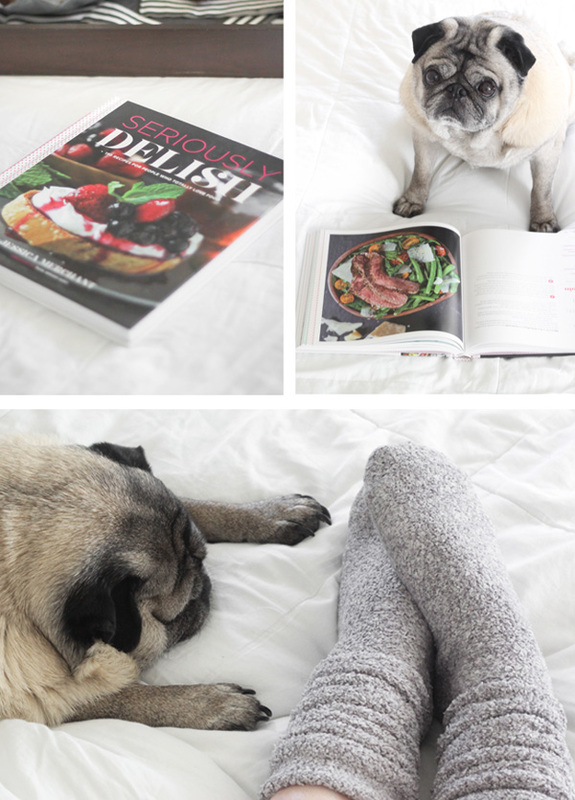 My favorite thing to do most evenings is to curl up with a good cookbook, a snack, and my two canine bookends. 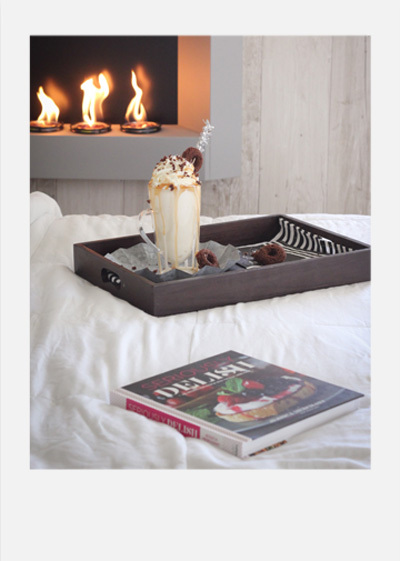 It's something I've always loved to do even before I started blogging, and not much has changed except that many of the cookbooks in my bedside pile are from my blogging peers! One of my recent favorites is from my pal Jessica of How Sweet It Is. 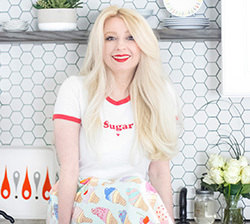 Her new cookbook is called Seriously Delish and it is outstanding. It's full of beautiful glossy images and Jessica's friendly relatable voice really shines through the written word. 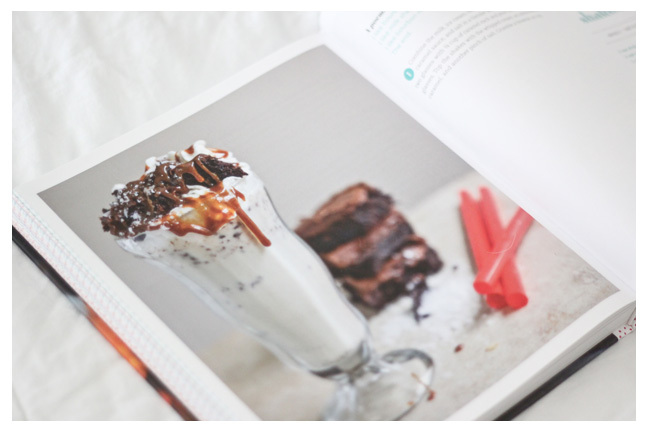 There's all kinds of recipes - certainly decadent desserts, but also lighter fare and what I call "solid food" (meaning food that isn't buttercream and has actual nutritional value - something I need to work on learning more about -ha!). To Enter! The contest is now closed - thanks to all who participated! PS. This milkshake tastes extra good while wearing fuzzy socks. PPS. I made the brownies for this recipe in my mini doughnut pan, which made them way too easy to eat! Combine the milk, ice cream, bourbon, brownies, 1/2 cup of the caramel sauce and salt in a blender and puree until smooth. 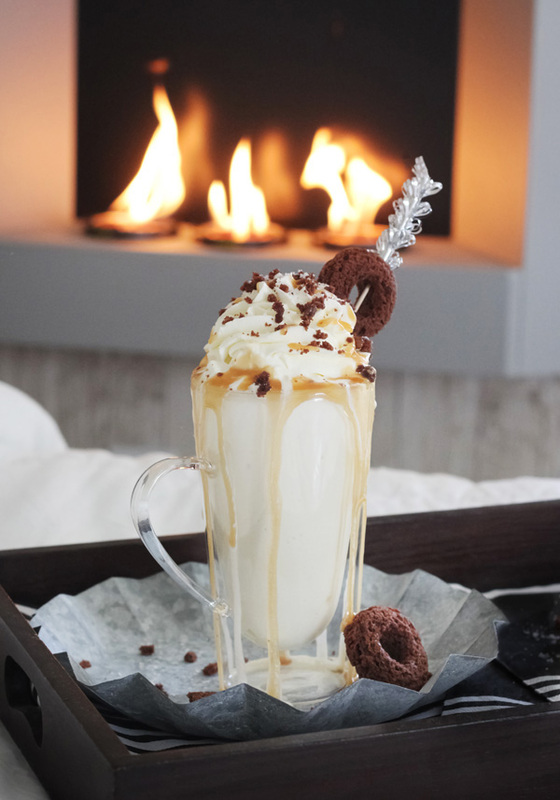 Fill two glasses with 1/4 cup of caramel each and pourthe shakes into the glasses. Top the shakes with the whipped cream, an extra drizzle of caramel and another pinch of salt. Crumble a brownie on top. This morning I was roused from sleep by a little pug burying himself under our bed linens. For the first time in many months the air in our bedroom was chilly. It was such a strong and obvious change, that I shouldn't have been surprised to discover that today is the autumnal equinox - happy first day of fall! Today is one of two days that (reportedly) have equal portions of daylight and dark (the other being spring equinox). I've been told that it's a good time to evaluate priorities and strive for more balance in life. Since that's a bit overwhelming for me to think about -I fall short in several areas- I'll work on finding balance in my baking; a little victory to help me on the way to balancing other, bigger things in life. To me, this treat is symbolic of today because it's all about contrast and balance. 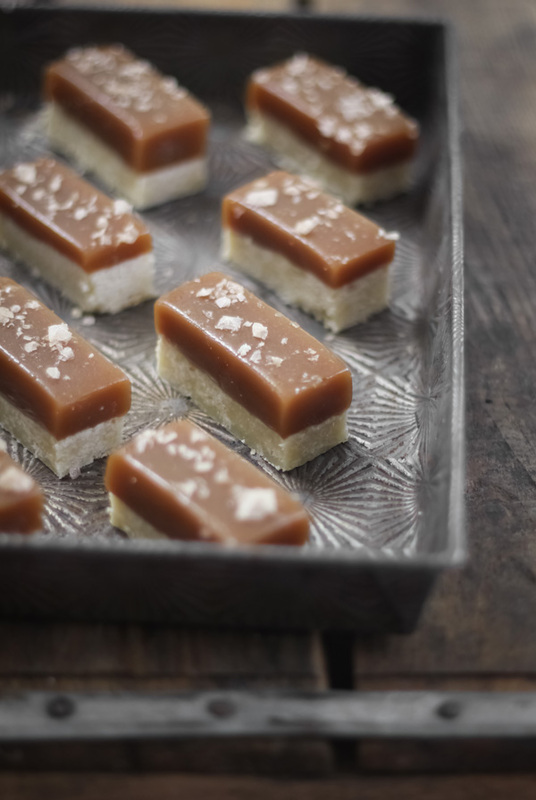 The crumbly shortbread crust is a nice counter to all that chewy caramel, and a sprinkling of smoked Maldon salt perfectly balances the sweetness. 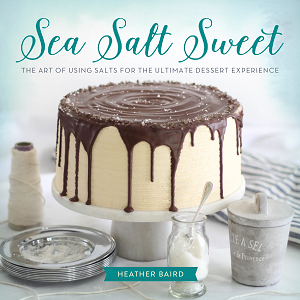 I know a lot of people who shy away from making hard candy, and I understand why. First, there's the boiling hot syrup that sticks to skin like napalm (been there, not fun!). And second, clean up isn't exactly easy. Pots and pans with stuck-on hard candy will sometimes take hours to soak clean. That's why I love this little project so much. 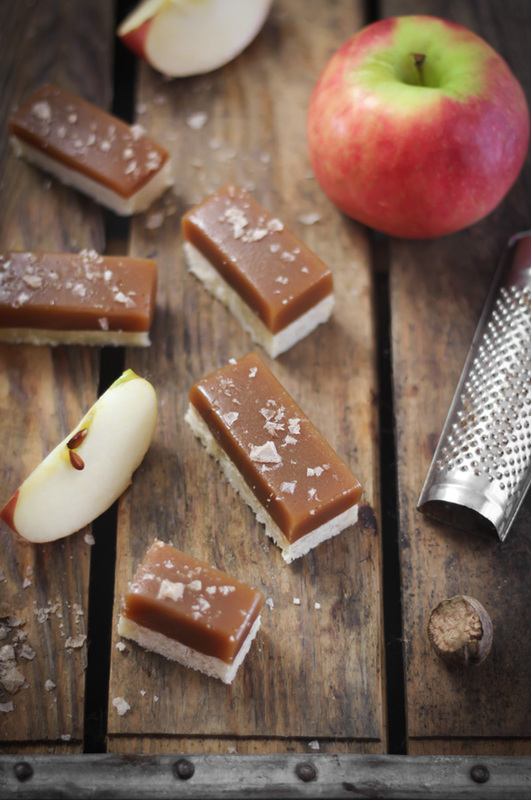 It's a no-brainer: no candy thermometer, and no dangerously hot sugar syrup involved. 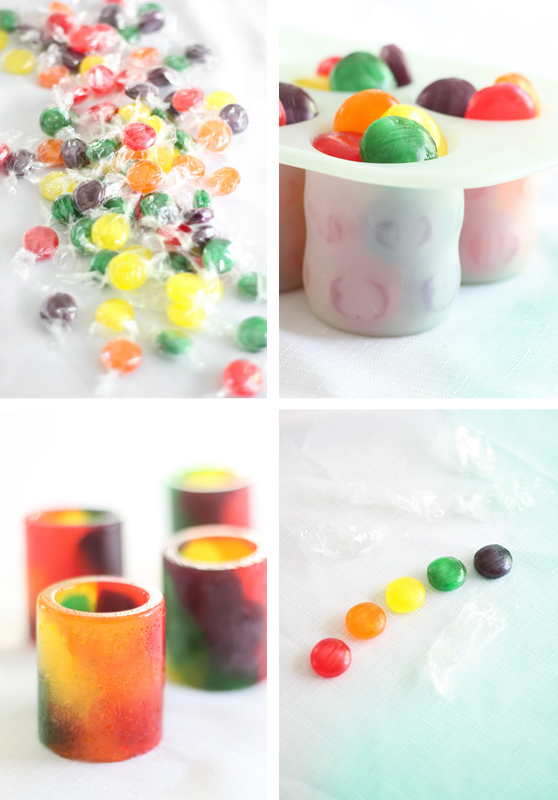 All you need is a bag of hard candy discs and a silicone shot glass mold. 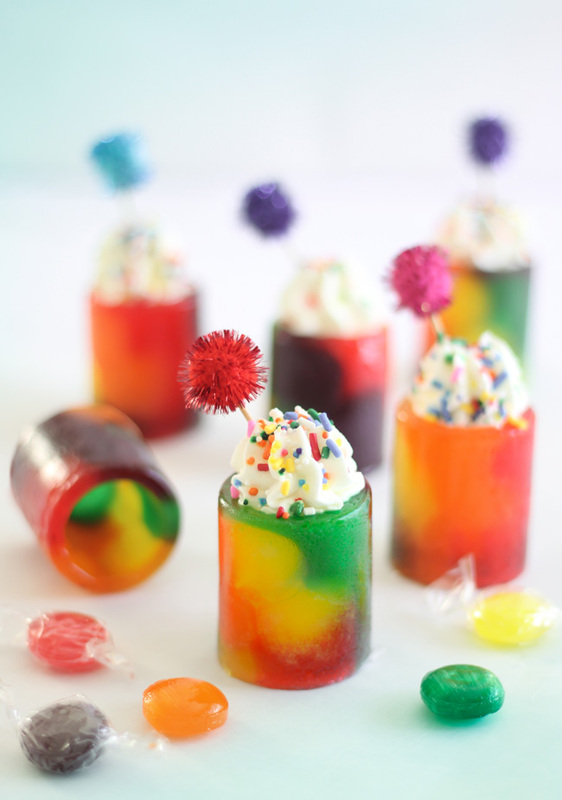 I got the idea for these candy shots a couple of weeks ago when Wilton sent me a box of products to test. Tucked inside, between mini loaf pans and sprinkles, I spotted an 8-cavity silicone shot glass mold. The packaging featured a shot glass made of Starlight mints, and I wondered if any hard candy could be used to bake shot glasses. Since then, I've tried all kinds: butterscotch discs, cinnamon discs, and assorted fruit discs (pictured). They all worked beautifully. My favorite result was with the ones made with assorted fruit discs. 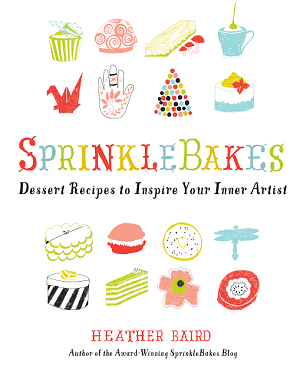 They bake into a vibrant rainbow swirl - so fun! To get started, you'll need to buy the silicone mold. You can find it here, or wherever Wilton products are sold (like the baking aisle in the craft store). You'll also need a big bag of assorted fruit-flavored discs. I used most of a 21 ounce bag (1 lb 5 oz) to make eight shot glasses. There must nine hundred and ninety-eleven recipes for homemade vanilla extract online, and I suppose that's why I've never seriously considered posting a recipe for it here. But I've had a change of heart, because it's something I make regularly and use in almost every sweet thing I bake. 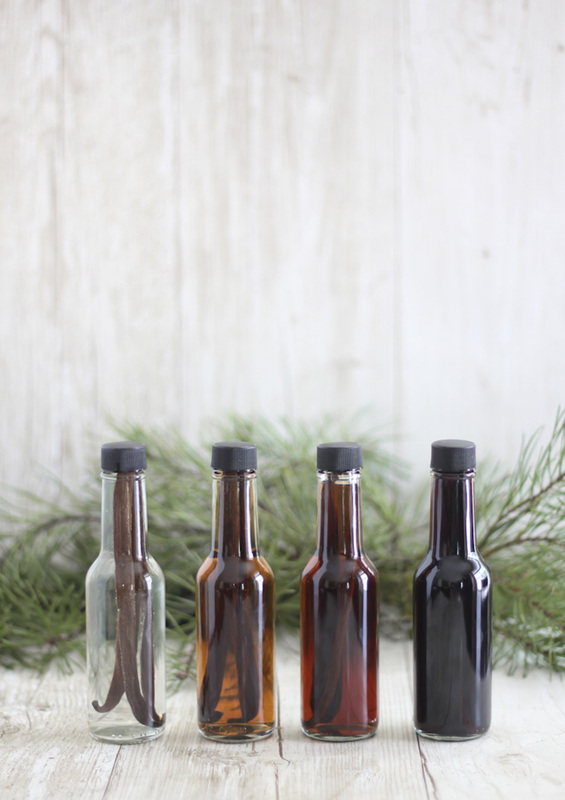 The reason why I love homemade vanilla extract so much is because I know it's pure (I control the ingredients), it costs less to make and - most importantly - the flavor is superlative. As far as staple ingredients go, it's pretty important to me. 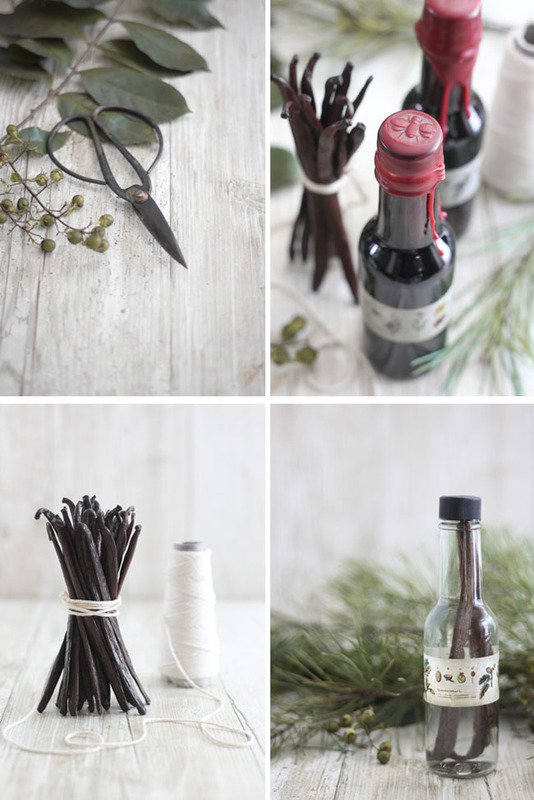 This year everyone on my holiday gift list is getting a bottle of homemade vanilla extract - not just the avid bakers in my circle, but also the occasional chocolate chip cookie makers and even my pal who uses her oven as a make-shift magazine rack (she likes vanilla in her hot cocoa and coffee). Everyone can benefit from the loving touch of a little vanilla, if you ask me. The bean pods need to steep for several weeks, so if you get started now (right now!) the extract will be ready in early December. It's best if the pods can steep for at least 8 weeks. In the picture above, you can see how the extract develops over time. You'll need just two ingredients and bottles with tightly fitting lids to make the extract. 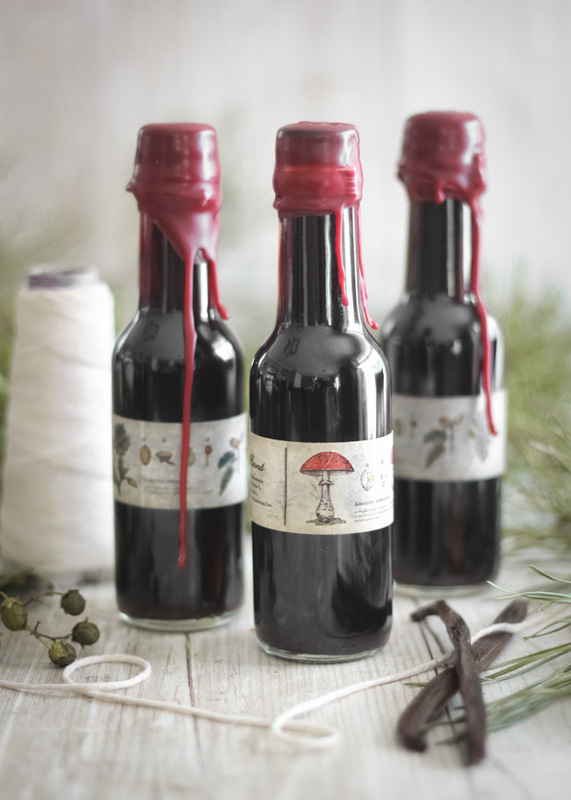 My personal touches to the bottles are wax-sealed caps and botanical washi tape "labels". Here's a run-down of everything I used, and a few links to the specialty products. Vodka 35-40% alcohol (70-80 proof): Opinions are sure to vary on this, but I say there's no need to buy top shelf. 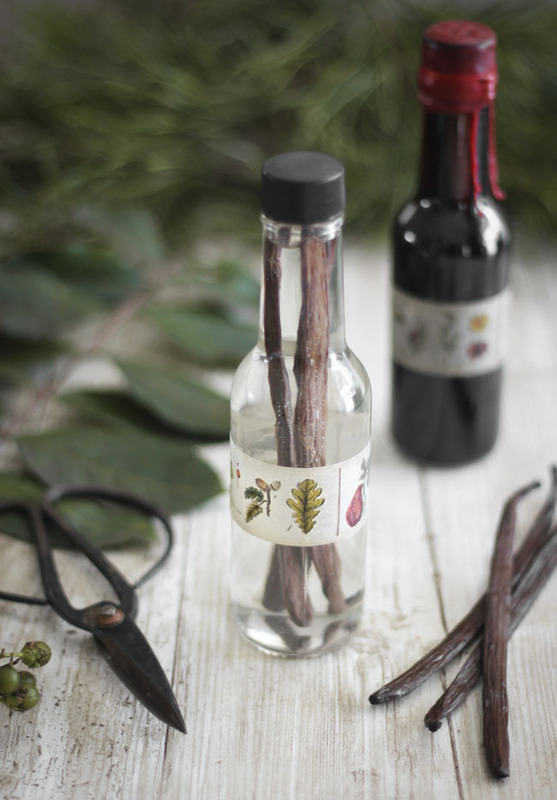 I usually buy an inexpensive variety of vodka, and make sure to steep the vanilla pods for a full 8 weeks before using the extract in a recipe. As long as the vodka isn't too harsh or bitter on the tongue, then it should be fine for extract making. I sometimes use Smirnoff because it can often be found on sale, or read the virtues of $8 Nikolai vodka here. Madagascar vanilla beans: These vanilla beans are strongly fragrant and have a creamy taste that goes well in cakes, cookies and quick breads. Vanilla beans in general can be awfully expensive, but if you them in bulk they cost much, much less. I've been a repeat buyer of this brand , and I've never had a bad batch. I usually get a few more than their promised 22-24 beans. My last shipment held 27 fat bean pods. I use these beans specifically for extract making, and save the more pricey Tahitian vanilla beans for custards and frostings. Edit: There are some negative reviews of these beans on Amazon, but I personally have never received any that were subpar. If you're not inclined to buy from this seller, Beanilla is also a supplier, and Frontier Co-op sells Fair Trade beans, which is always a good choice. Lidded 5 ounce bottles: These are actually sold as hot sauce bottles, but their size was spot-on for gifting. They're bigger than the usual 2 ounce grocery store bottles, and tall enough to accommodate most whole beans. I only wish these came in amber or green bottles, because dark bottles will obscure sunlight and prevent the flavor from being sapped over time - although that's not a real concern for me, I go through bottles of vanilla extract very quickly. Sealing wax: I used burgundy sealing wax on the bottles I'm gifting. This kind of wax, in bead form, melts easily. I heated it in a small metal measuring cup over medium heat on the stove-top. You could also use a small aluminum disposable pan in which to melt the wax, for easier clean-up. 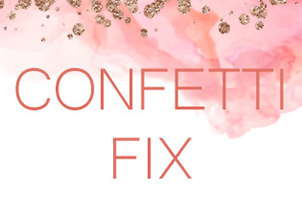 Decorative washi tape: This is not essential, but it is quite pretty. I found a forest botanical print tape at Terrain Shop (sold out!) now sold here on Amazon. Something about those little mushrooms made me feel happy. 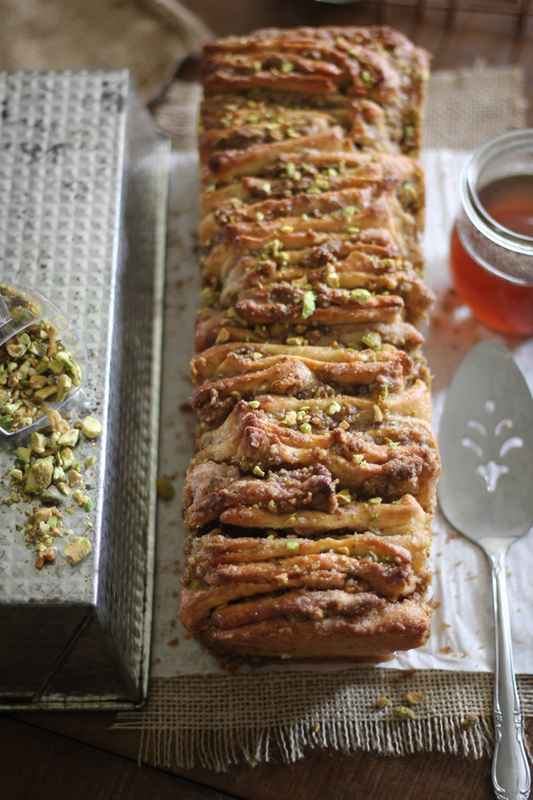 I can't tell you how many times I've drooled over the thought of making pull-apart bread in my own kitchen. I've seen all different varieties - sweet and savory, lemony and cheesy- from my blog buddies and beyond. I've been itching to put a new spin on the recipe, and that's the only reason I've waited so long to make it. 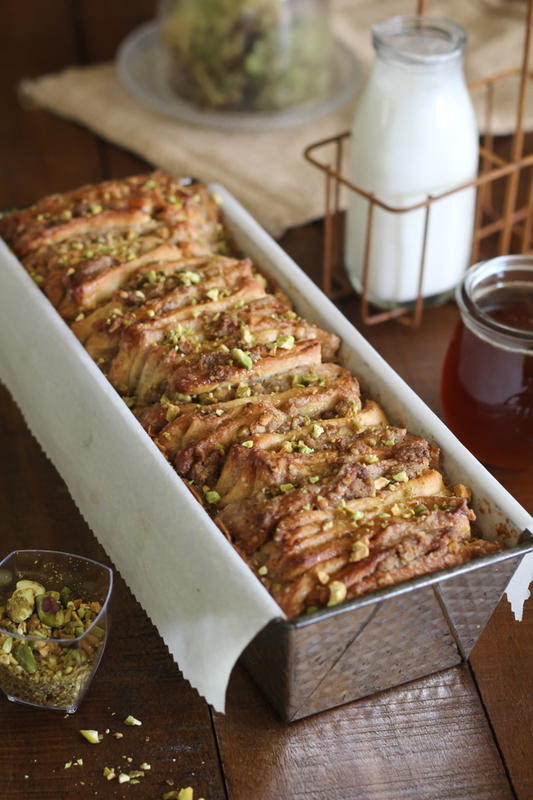 Perhaps you remember the time I made Baklava Cheesecake. All that nutty goodness seemed to improve upon something that is hard-pressed to be made better (because, cheesecake alone is pretty darn good!). I felt in the same quandary with this bread. After some meditation, I dug out my baklava filling recipe. Here's where I lose my modicum of correct grammar: YOU GUYS. This bread is all kinds of major. 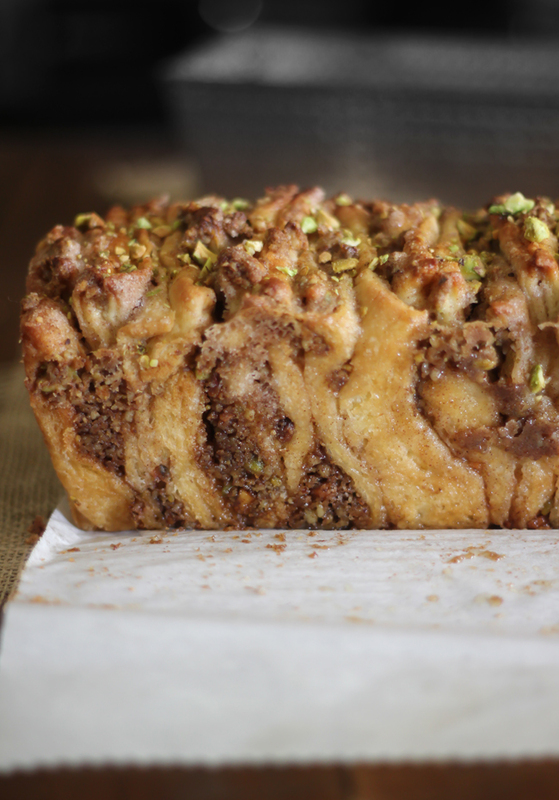 Those delicate layers of cinnamon-sugared bread? They hold pockets of nutty baklava filling. It all bakes up so perfectly together. And if that wasn't enough, it also gets a douse of honey syrup. I have but one complaint with most yeast dough recipes, and that's yield size. If I'm going to spend the better part of a day babysitting dough, then I don't want a measly dozen buns, or just one loaf of bread. So, I've developed this recipe to yield two loaves - one for you, and one for a friend (or one for the freezer, if you're not feeling particularly charitable). I've always wanted a waffle cone maker, but admittedly, there's very little space in my cabinets for one to live. I've talked myself out of buying one many times, but the desire came back anew when I walked into my favorite ice cream parlor. I can testify that the warm fragrance of freshly made vanilla waffle cones is strongly persuasive (not that I needed much arm-twisting in the first place). So, I got one. 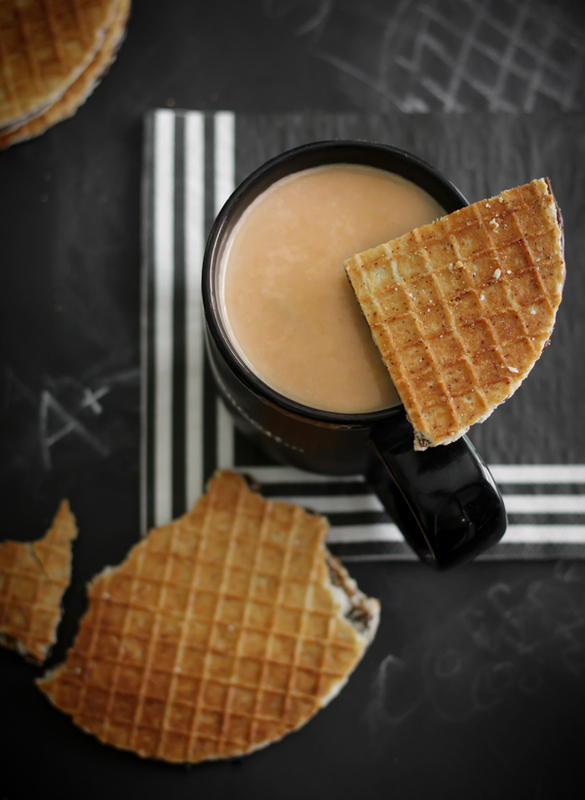 I fully expected the machine to be single purpose (waffle cone iron = only waffle cones) but I've found it has a second, and maybe even better use for making one of my favorite coffee time treats - stoopwafels! 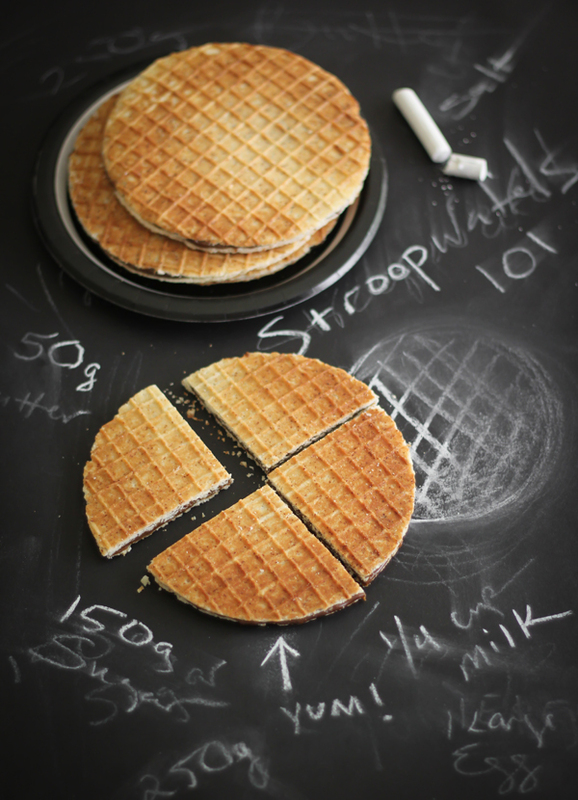 For those not familiar, stroopwafles are thin cookie-like waffles with a chewy caramel syrup in the center. They hail from the Netherlands, and recently my friend Darla (who happens to live in Nederland) sent me a care package with all kinds of delicious Dutch treats inside. To my delight, authentic stroopwafels were included. They were better, more dense with filling, than the ones I can find locally. That made me curious enough to seek out a stroopwafel recipe. Until now, I'd never dreamed you could make them at home. 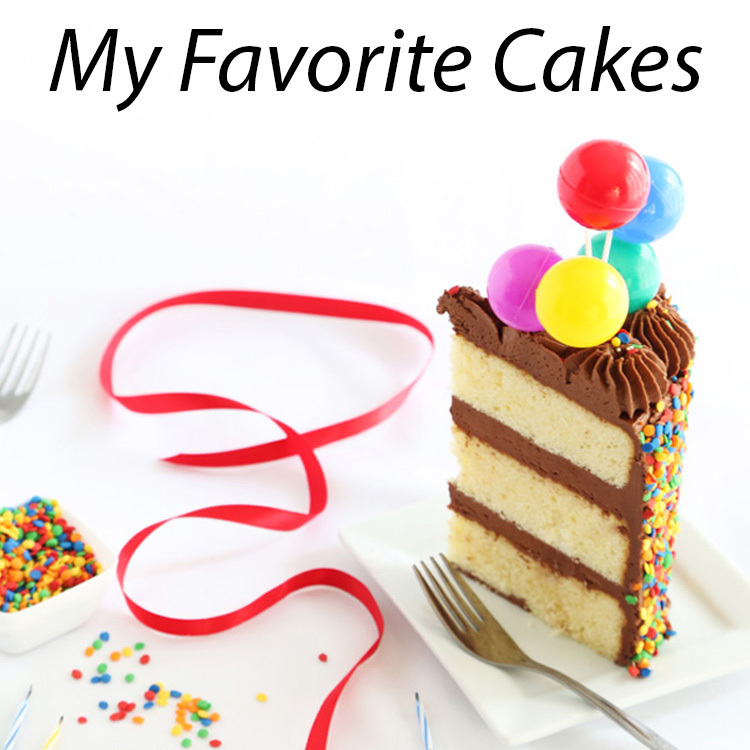 I'd pondered their thinness while eating one, and figured it defied any tool that inhabited my utensil drawer. 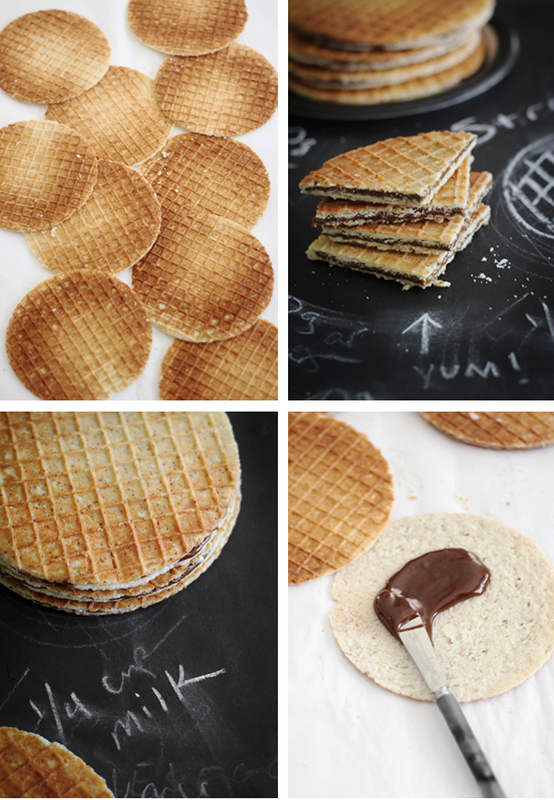 To my great surprise, scratch-made stroopwafels are achievable.